Differential and difference equations have long played important roles in the history of theoretical models. The oscillation theory as a part of the qualitative theory of these types of equations has been developed rapidly in the past thirty years. The extensive application prospect facilitates the development of this field. 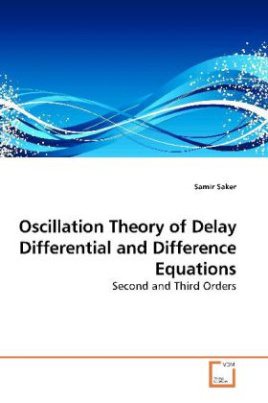 Our current book tends to center around the relevant oscillation of second and third order functional differential and difference equations, neutral differential and difference equations and some applications on partial delay equations. The book stresses the similarty of the techniques used in studying oscillation of differential and difference equations and brings the reader to the forefront of current research in this prosperous field. As always, it is impossible to cover all of the relevant results in one book, so the book is concerned with the rescent results, where the selection of the material is largely infuenced by the author interest. The book contains 185 illustrative examples.